Automation systems consulting requires a company that truly understands all aspects of automated equipment and systems from concept to completion. Automation systems consulting plays a huge role in the initial design and development of an efficient and dependable automated system. At Dial-X Automated Equipment, Inc., we provide automation systems consulting services for all aspects of the development process, including the design, the components, the assembly and the integration. 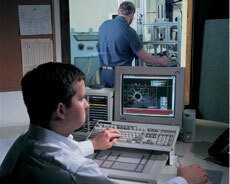 In addition to consulting on automation systems that we develop, we also consult on the work of other companies, including providing system evaluations and recommendations, consulting on processes to eliminate, combine or add automation equipment, providing justification for doing an automation system, evaluating the options of repairing systems versus developing a new system, and much more. We also do a lot of consulting on rebuilding, retrofitting and/or making modifications to existing automation equipment and systems, including options for converting existing automation systems to run similar, but different parts. For further information or a free quote on automation systems consulting, contact Dial-X Automated Equipment, Inc.